PayTunes is an android app where you can earn free recharge by letting the app change your ringtone into ad jingles. Before I begin the review let’s know more about the PayTunes app. PayTunes was founded by Gaurav Tiwari, Rakesh Sehgal and Divya Pratap Singh in 2015. It was developed to provide brands with a unique way of promotion and users to earn some cash by letting them advertise through their phone. PayTunes is available in India only. Like I said earlier, PayTunes changes your ringtones to ad jingles. Advertisers at PayTunes include SBI, Myntra, Pizza Hut, Saavn, and Renault. After you register and give the necessary permissions Paytunes will download audio-ads based on the details you entered while signing up. After that every time you get a call on your registered number an ad jingle will be played(when ads are available) as your ringtone. And you’ll earn points. You can also earn points by downloading apps from the “More Points” tab. You can view and listen to the ads that are/will be played when you receive calls by going to the sidebar menu and tapping on “My Ringtone Ads”. You can also remove the ads that you don’t want to be played. You can use points to buy Tambola tickets. 40 points= 1 ticket.. When you buy these tickets, you participate in the daily lucky draw contest. The more tickets you buy the more are your chances of winning. Also, you will get Rs.1 for each ticket you buy. You can use this cash to recharge your mobile or DTH. 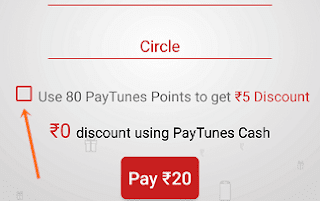 You can earn Rs.4 for every friend that installs & register on PayTunes and enters your referral code and downloads an app from the “More Points” tab. And when your referred friends will get 40 points as a sign-up bonus. You can redeem your points to get discounts on mobile recharge/DTH through debit/credit card and net banking. Discount of Rs.5 with 40 points for recharge of Rs.50 or above. Discount of Rs.10 with 80 points on recharge of Rs.100 and above. On play store, PayTunes has a decent rating of 4.1. but recently there are many complaints that they are not paying for months. Since, I didn't use the app for long enough to accumulate enough points for redemption, can't say whether the app is legit or scam. So, I don't recommend using PayTunes. Although PayTunes pays you for doing nothing. But, ad-jingles can be a bit embarrassing when you are in public places or with friends. Moreover, the points can only be used for discounts on recharges and you can only get a discount up to Rs.10. Which is certainly not worth the embarrassment that the ad jingles can cause. Sure you can buy tambola tickets for 40 points and get Re.1 per ticket stand a chance to win recharges but to earn points you’ll still need to listen to ads. Yes, you can earn Rs.4 by referring your friends but they will have the same issue. So, you shouldn’t waste your time on this app. Lucky Day App Review 2018: How to Earn from it?